Auto Repair & Collision Center Serving The Woodlands, Texas. Committed to providing the best auto repair services in the Woodlands, TX. The Woodlands Car Care and Collison Center is recognized as one of the top collision and auto repair shops in The Woodlands, Texas, since opening its doors in 1995. Our I-Car Platinum certified facility will make sure your vehicle looks showroom quality, while our ASE master certified technicians make sure your car drives at peak performance. Our technicians utilize state-of-the-art technology and best-in-class diagnostic equipment when inspecting your vehicle for auto repair, maintenance service and collision repair damage. We are a customer-focused auto repair and auto body facility. Our goals for our collision shop is to repair the damage to your vehicle to the high-quality specifications established by the manufacturer of your automobile. The goal of our auto repair shop is to repair and maintain you vehicle to the high-quality repair standards provided by the dealer. 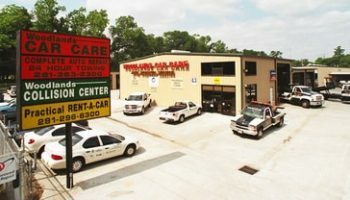 The Woodlands Car Care and Collision Center take the time to understand your concerns and provide customer solutions throughout the auto repair and collision process. Customer service is our top priority. David was great! Love the customer service and service done to my car. In the event of another accident we will definitely bring the car back. Saved me a lot of money. More then once a mechanic at another shop told me something was wrong with my vehicle and I took it to Woodlands Car Care since it sounded fishy and sure enough, turns out, it was an easy and cheap fix. Frankly I don’t know more honest car shops in the area. We are family owned and operated, and proud to be recognized by the American Automotive Association (AAA) as one of the best shops in The Woodlands, TX. At The Woodlands Car Care and Collision Center we service all makes and models of import and domestic vehicles. We handle auto repair ranging from oil changes to engine services, and collision repair ranging from small dent repair to major automotive body work. Woodlands Car Care and Collision Center is your ultimate auto and collision repair shop in The Woodlands, Texas. We are conveniently located off highway 45 on Budde Road. Our shop has Wi-Fi and a comfortable coffee lounge while you wait. We also have loaner cars and a free local shuttle if you need additional transportation. Get directions to Woodlands Car Care and Collision Center or call us with your automotive questions. Should I Contact my Car Insurance for a Small Dent? How do I fix a small dent in my car?